Innovation is our company identity, intuition guides our history. 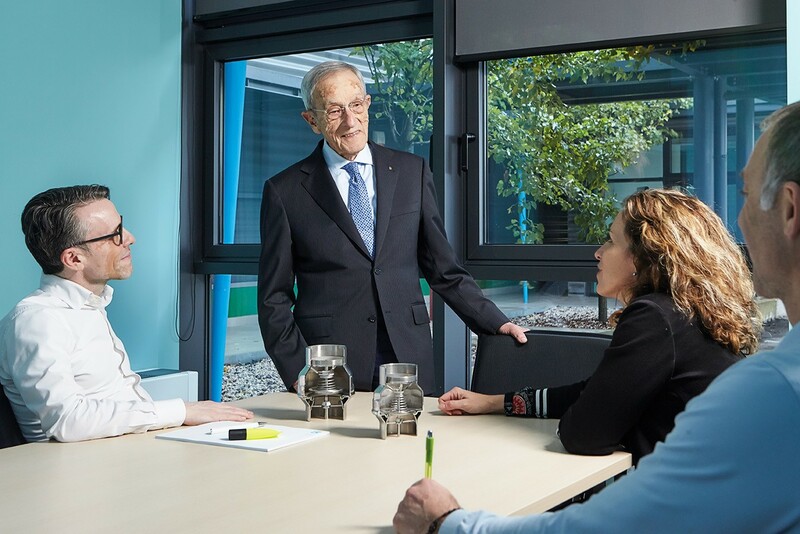 The story of Mondeo began in 1986, when its founder, Giancarlo Ghiotto, decided to specialise in the production of hydraulic valves. After establishing a company that made electric motors for single phase pumps, followed by a motor pump company, he chose to apply his experience to the movement of fluids, more precisely to the component that regulates the flow and which therefore plays a fundamental role in guaranteeing specific pressure and flow rate values. It was his business spirit, but above all his immense curiosity and strong love for research, that pushed him towards this new adventure. Using a formula that was already successful for hydraulic pumps, Mondeo presented itself to the market with a totally innovative product: a valve made of stamped stainless steel. It was a true sector novelty, and a completely different production philosophy. The advantages of stainless steel are evident: longer-lasting valves, less head loss, so less consumed energy. The challenge was to introduce a product made from a higher quality material than brass, but with a more reasonable price than cast steel. The first to welcome the new formula, which blended quality, efficiency and a competitive price, was the German market, particularly sensitive to quality and already insistently heading towards the use of stainless steel in hydraulics. After this important recognition from a market that is famous for its authoritativeness in the hydraulics sector, the company never stopped growing, investing in research, new products and marketing at world level. Today Giancarlo Ghiotto, chairman of the company, works alongside his children Nicola, managing director since 2016, and Lorenza, who heads the company’s internal coordination. Being a family business gives the company added value according to Mondeo, value that translates internally into a climate of collaboration and trust, and externally into a direct, personal approach to clients. Mondeo S.r.l. is established, with the aim of producing and marketing hydraulic accessories made of printed and welded stainless steel. The first series of check valves made of stamped stainless steel, called Cromax, is launched. Mondeo decides to complete its offer with the marketing of some hydraulic accessories made of stainless steel, such as tanks and fittings. The second generation of stainless steel check valves is created. Called “Idjra”, it is a development of the first Cromax series. Mondeo Gmbh is established, a business branch for serving the German market in a capillary manner. Mondeo begins producing stainless steel manifolds, applying the same valve production philosophy to this new product: maximum hydraulic efficiency. 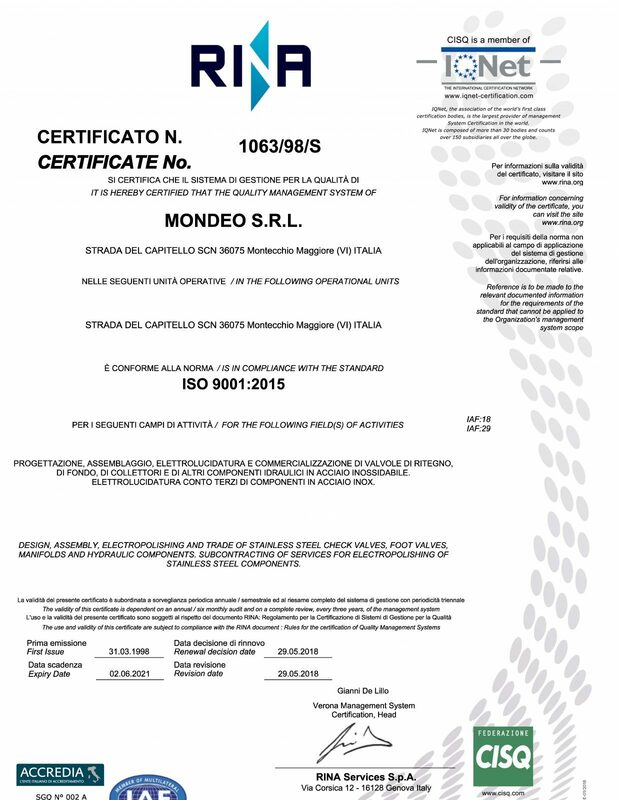 Mondeo’s quality management system obtains UNI EN ISO 9001:1994 certification. Partnership established with the company Genebre for product distribution. 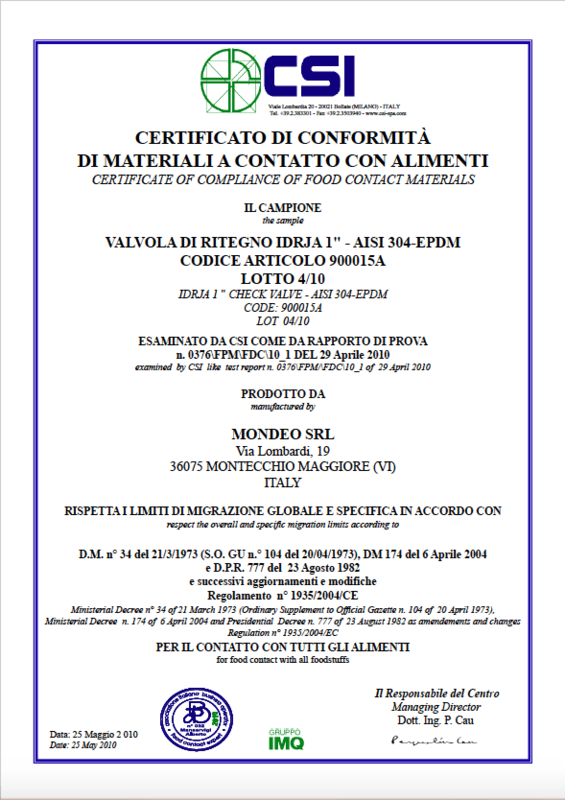 Mondeo obtains compliance certification regarding materials that come into contact with food for its Idrja check valves and New Dual manifolds. Mondeo presents Water Island, a solar powered water pumping station. 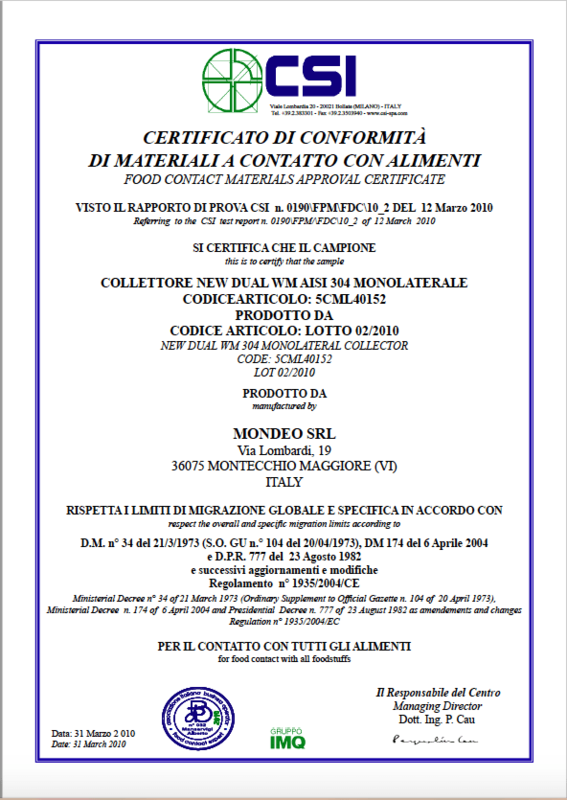 Partnership established with companies Aspen and Tecnoplastic for product distribution. The company transfers to its new headquarters with more than 3,000 square metres of covered surface area. 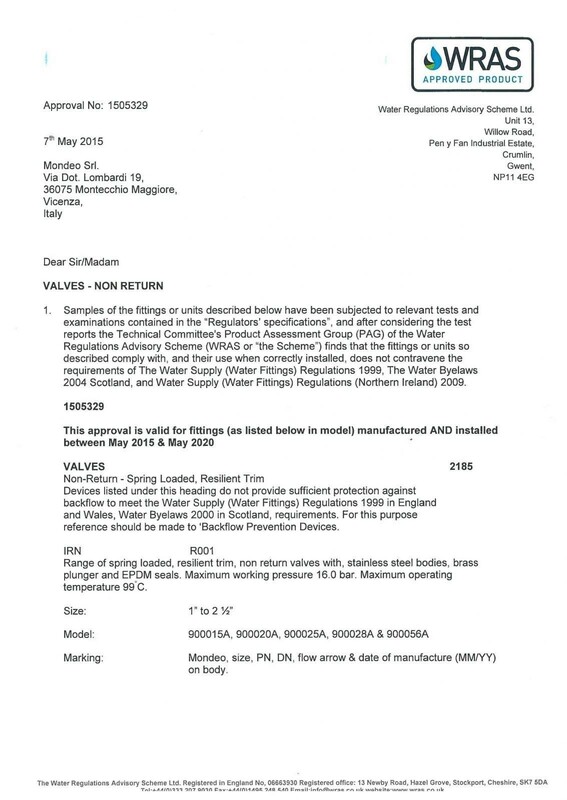 Mondeo receives Wras certification for its Idrja valves. WRAS certification guarantees product compliance with the safety requirements for manufactured products designed for use with potable water that are in force in Great Britain. New electropolishing line for treating our products, but also for third party contracts. New line for producing manifolds. Development of products for industrial automation and for IOT.